Oatmeal is the secret ingredient in this sloppy joe recipe! It adds bulk and thickens the sauce, giving a great texture to this twist on the comfort food classic. This recipe also incorporates additional vegetables into the mixture adding to the flavor and texture of the Sloppy Joe. Everything is prepared in the MultiPot pressure cooker so it is ready to serve on warm, toasted hamburger buns in just 20 minutes. Add a pickle spear and a handful of potato chips to the plate for the full American diner experience! Legend has it, the original "Sloppy Joe" sandwich was served in Sioux City, Iowa in the 1930's. It was a loose meat sandwich made with ground meat, onions, ketchup, Worcestershire sauce, and other seasonings, and served on a hamburger bun. It was created by a cook named Joe and the rest is American culinary history! Per Serving: 214 calories; 7g fat; 12.6g carbohydrates; 24g protein; 67mg cholesterol; 636mg sodium. The rolled oats in the sloppy joe was a nice addition to thicken the sauce. Just a delicious and messy sandwich. Had a ton of leftovers, so decided to wrap the remainder in lettuce cups for the rest of the week. 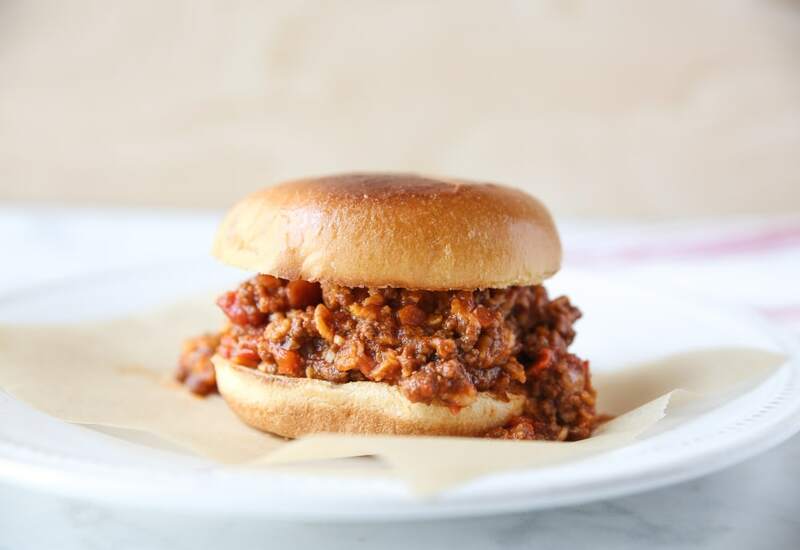 I loved sloppy Joe's as a kid and this recipe just brought back all of the good childhood feels. Not only does it taste amazing, but it is so quick to make, perfect for after work when you want something good and hearty but don't want a lot of labor and cleaning afterwards. I made this dish and was really surprised how well it turned out. You can't even taste the oatmeal in the recipe. The sauce was the perfect consistency. Overall it was hearty, rich, and down right delicious comfort food. Excellent recipe. I’ve made a lot of sloppy joe since becoming a dad, and this one is among the best I’ve had. The boys liked it, so that's good enough for me. I added a pinch of chipotle powder to the mixture for a hint of smoky spiciness. Was just enough to make it interesting for the adults without overwhelming the kids. Served on toasted cornmeal-dusted kaiser rolls & with tater tots, of course! When I saw oatmeal, I'll admit I was a skeptic. Well, I am not at all disappointed with the way this recipe turned out. The meat sauce was extra thick and bulky, which resulted in perfect sloppy joe meat. I can snuck in carrots (not peppers) that my kids would otherwise not eat. I think from start to finish the cooking time for this was under 45 minutes, including the time it takes for the pressure to rise. These Sloppy Joes were delicious!! I’m ll definitely be making them again!! My family loved this recipe. I love that it didn’t have ketchup like many other recipes do and it wasn’t sweet. I did cut the oatmeal amount in half as I found it kind of weird, the meal still tasted delicious and you can’t really tell there’s oatmeal in there! Super easy and great recipe. Couldn’t even tell the oats were in there; I asked my husband to guess the secret ingredient and he couldn’t! I like the addition of oats for an extra nutritional value for my son! Will definitely make again! It had a different kind of taste. My family still ate it but I won’t make it again. Hmmmm too much sour with both vinegar and worcheschire sauce. More my fault for not tempering ingredients, but I’ll get it right next time around.